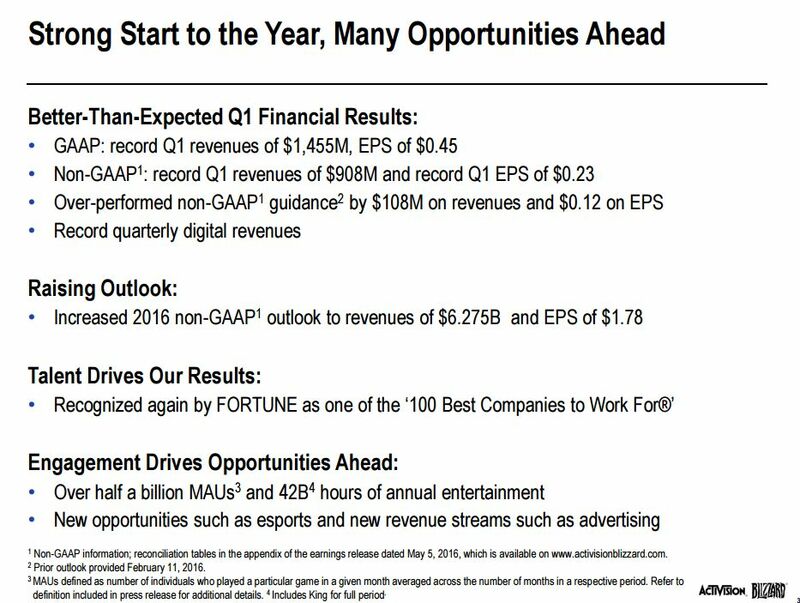 Activision Blizzard has released its Q1 2016 financials, reporting record digital revenues, and spikes in monthly active players for Call of Duty and Blizzard titles. Destiny has now reached close to 30 million registers players. Call of Duty: Infinite Warfare pre-orders “tracking high”. Destiny’s 30M players have spend 100 hours each playing. Overwatch open beta already has millions playing. Hearthstone has over 40M players. 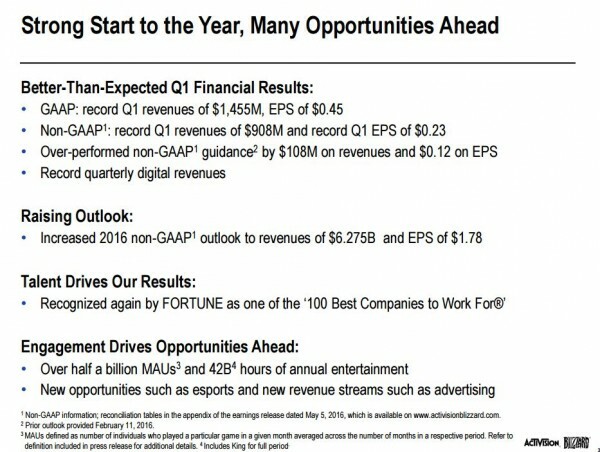 The firm highlighted its Q1 online player community, reporting monthly active users (MAU) of 55 million, up 10% year-over-year. 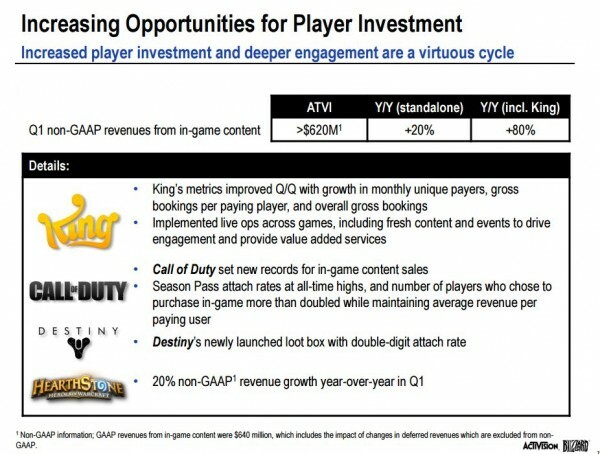 In particular, Call of Duty MAUs were up quarter-over-quarter and year-over-year. 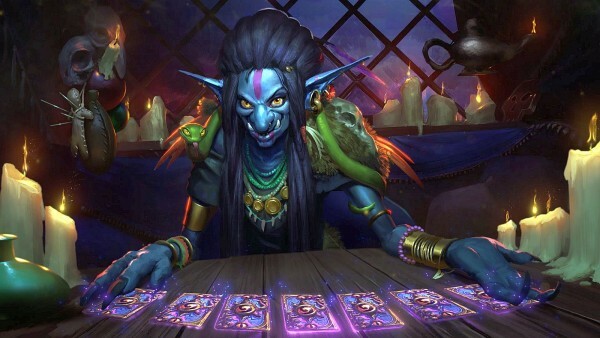 Blizzard’s combined games had a total of 26 million MAUs up 23% year-over-year with Hearthstone surpassing 50 million registered players – as previously reported. Player figures for the game sat around 40 million back in November. Hearthstone’s daily active users and record hours played has risen since the Whispers of the Old Gods expansion launched last week. Destiny has nearly 30 million registered players. As previously reported in November 2015, the game had 25 million players. Activision said during the call to investors that each players has logged over 100 hours on average playing the online shooter. 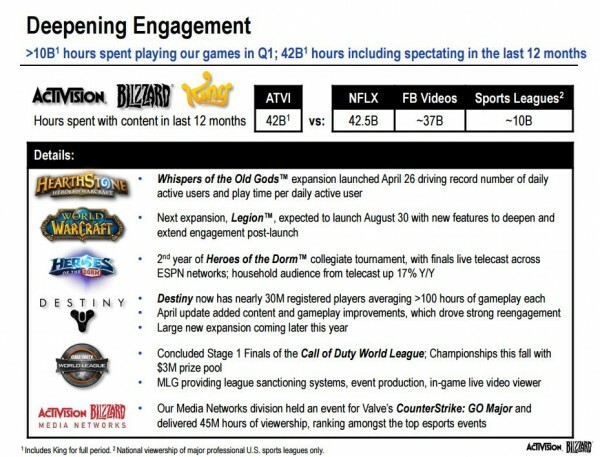 In all, over 10 billion hours were spent playing Activision-Blizzard games during the quarter. 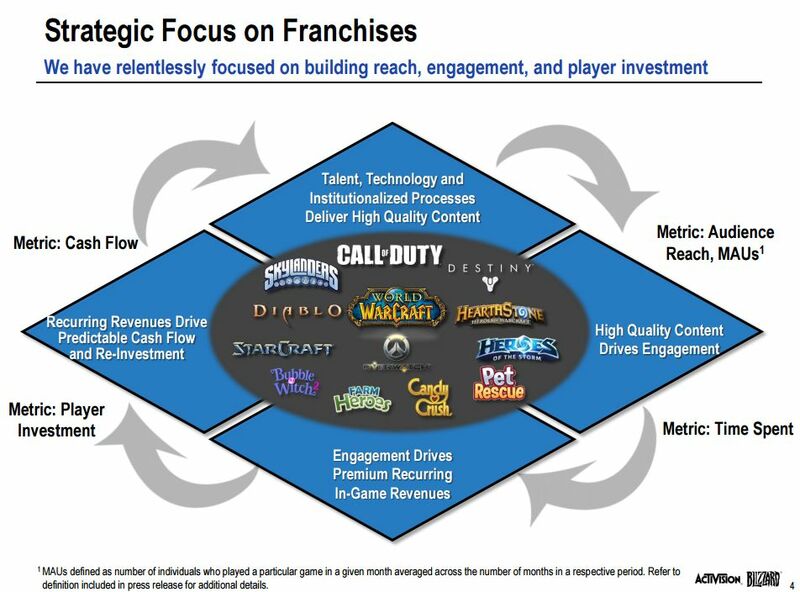 If you have a look at the slides posted below, you’ll see more details and numbers on user engagement with Activision-Blizzard titles. During the call to investors, Activision’s publishing boss Eric Hirshberg said there will opportunities for fans to get their hands on Call of Duty: Infinite Warfare later this year. Without providing figures, Hirshberg said pre-orders for the militarized space title are already rather high. While on the call, he took a question regarding the number of dislikes the Infinite Warfare reveal trailer had been given the day it was released. Hirshberg said Call of Duty: Black Ops 3 faced the same situation when it was announced, likely due to the game’s futuristic setting. Hirshberg went on to say the company realizes many Call of Duty fans are “nostalgic for boots on the ground gameplay,” which is why Activision is remastering Call of Duty: Modern Warfare and including it with Infinite Warfare. This way, both camps will be satisfied and those who have not played Modern Warfare can experience one of the most “beloved Call of Duty games” on current generation consoles. During the investors call, Activision reiterated there will be two more Black Ops 3 content drops this year, and highlighted the game’s engagements stats. The game’s monthly active users (MAU) and digital sales such as season passes and DLC are both at an all time high. With Destiny, as reported above, the game now has close to 40 million registered players which have spent 100 hours in-game, on average. 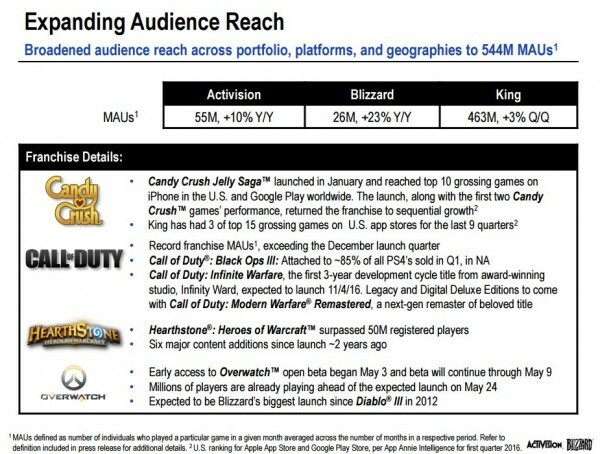 Activision said this is a testament to the popularity of the April update, which is the 40th since the MMO launched. Hirshberg said Bungie has been having a tough time keeping up with demand for new Destiny content, but the large, new expansion is expected later this year and it will give players more to look forward to. More information on the expansion will be revealed in the coming months. Blizzard president Mike Morhaime said the Overwatch open betaa, which went live just yesterday, has already seen millions of players. 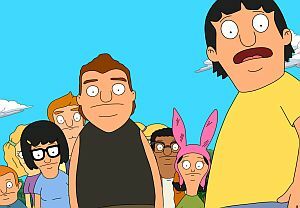 This will be the developer’s first simultaneous, multi-platform launch and its biggest launch since Diablo 3. The firm also expects eSports events for the title to help drive engagement. For the quarter ending March 31, Activision-Blizzard reported record net revenues of $1.46 billion, compared to $1.28 billion during Q1 2015. 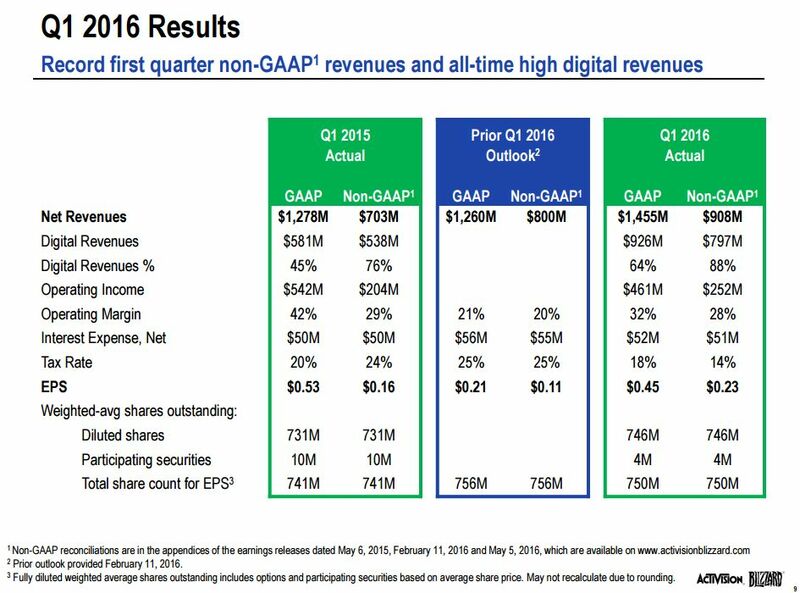 Revenue from digital came in at $926 million, up 59% year-over-year and representing a Q1 record 64% of the company’s total revenues. 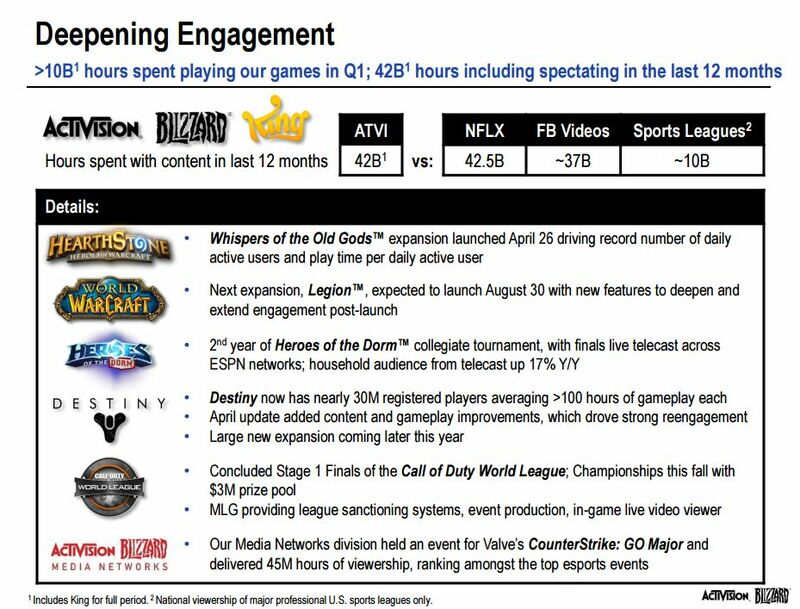 Activision said 42 billion hours were spend playing and watching its games – which is four-times the viewership of national sports leagues watched on ESPN and other stations combined. The second year Heroes of the Dorm Tournament, broadcast on ESPN, saw an viewer uptick of 17% over last year. King, the Candy Crush company which Activision purchased last year, is looking into opportunities to create “even greater games by adding in existing IP.” These opportunities are to be explored for the mobile sector, but will only be developed for the mobile market if it makes sense. Activision-Blizzard is also working on new content and updates for existing franchises across its portfolio; working on new titles within these franchises; and developing new IP in its studios.